It’s a sun-drenched Sunday in Chicago’s Washington Park on the northern lawn of the DuSable Museum, where the leaves of large oak trees offer a comforting shade to a grassy hollow at the foot of 18th-century German writer Gotthold Lessing’s statue. The South Side park is the perfect place for a picnic, space to daydream or a rejuvenating yoga session with Aya-Nikole Cook. For two soothing hours, Cook leads her Sunday Sanctuary class in gracefully arduous movements and mindful breathing – an exercise inspired by the Vinyasa traditional practice. Cook is the personification of such requiescence. The 42-year-old sits upright, fully in control of her body, pausing for breath and thought in between each of her sentences. 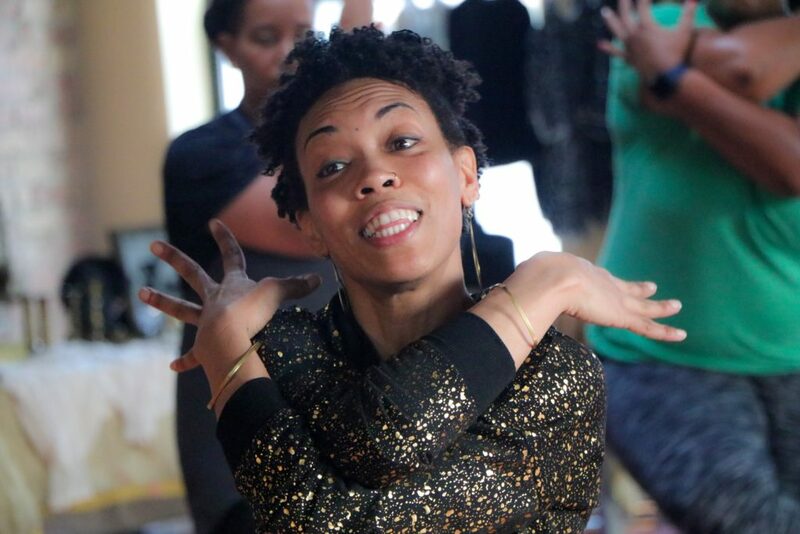 Born and raised in South Shore, Cook is the owner of Haji Healing Salon, a restorative space in Hyde Park which specializes in community yoga and acupuncture as methods of healing underserved communities. She started the salon in 2015 during her residency at the University of Chicago’s Arts + Public Life initiative, where she studied under the Creative Business Accelerator Program. While there, Cook’s idea for what would become Haji Healing Salon grew in size and ideology. Cook is on a path toward healing. It’s a journey she unknowingly started at age 16 after reading the 1992 Queen Afua book, Heal Thyself for Health and Longevity. Instantly, Cook gave up pork in a household that ate bacon every morning for breakfast and pork chops once a week for dinner. Once she was diagnosed with fibroids at 32 years old, the urgency to heal her body intensified. “That [fibroid diagnosis] changed everything,” Cook says. Fibroids are noncancerous yet sometimes painful tumors that develop in a woman’s uterus. The disease can be hereditary – in Cook’s case, her older sister, mother and grandmother suffered from fibroids. But, according to researchers, uterine fibroids are three times more likely to appear in Black women than any other race. After her diagnosis, Cook wanted to do a better job at understanding her body and its needs. Being healthy is a revolutionary act, according to Cook. By this, she’s referring to the pharmaceutical machine – where companies and investors will always turn a profit from unhealthy diets and sickness. And which population of people is most at-risk of heart disease and diabetes, and without access to healthier food options? Black people. This began Cook’s shift from a meat-heavy diet to a plant-based one. The results were undeniable, she says. For starters, she no longer experienced heaviness or unwarranted mucus build-up during yoga once she gave up eating greasy foods like pizza the night before practice. Now, her daily routine includes things like drinking warm water with lemon in the morning to jumpstart her body, or brushing her teeth with non-chloride toothpaste and activated charcoal. These changes not only made her fibroid-free, Cook says, but also fueled the holistic ideology behind Haji Healing and the urgency to teach wellness in the Black community. That’s why, in a few months, Cook will relocate Haji Healing from its quaint Hyde Park digs – where you have to schedule an appointment to receive the address – to a permanent home on 79th Street in Chatham. There, she plans to hit the streets, teaching a free 5-Minute Feel Good practice to anyone who is willing to give yoga a try. Each participant will leave with an illustrated guide, prepared by Cook, so they can continue practicing yoga on their own. For others who are interested in practicing yoga or acupuncture at Haji Healing, Cook’s prices begin at $10 for yoga and $25 for acupuncture.